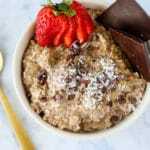 This recipe is a paleo and grain-free version of oatmeal using cauliflower rice. Place your choice of dairy-free milk in a medium saucepan and bring to a gentle simmer. Add the cauliflower rice and stir to combine. Let the mixture come back to a boil, reduce the heat to low, and cook for an additional 2-3 minutes. Stir in the eggs, cocoa powder, and collagen protein. Cover the pot and let it simmer for 2-3 more minutes for the eggs to cook through. Stir once more before serving. Top with chopped fruit and your choice of sweetener*. *You can also stir the sweetener into the mixture before serving, if you prefer.